Happy weekend! My Saturday is almost coming to an end for me. Weekends always go faster than the weekdays. Not happy! 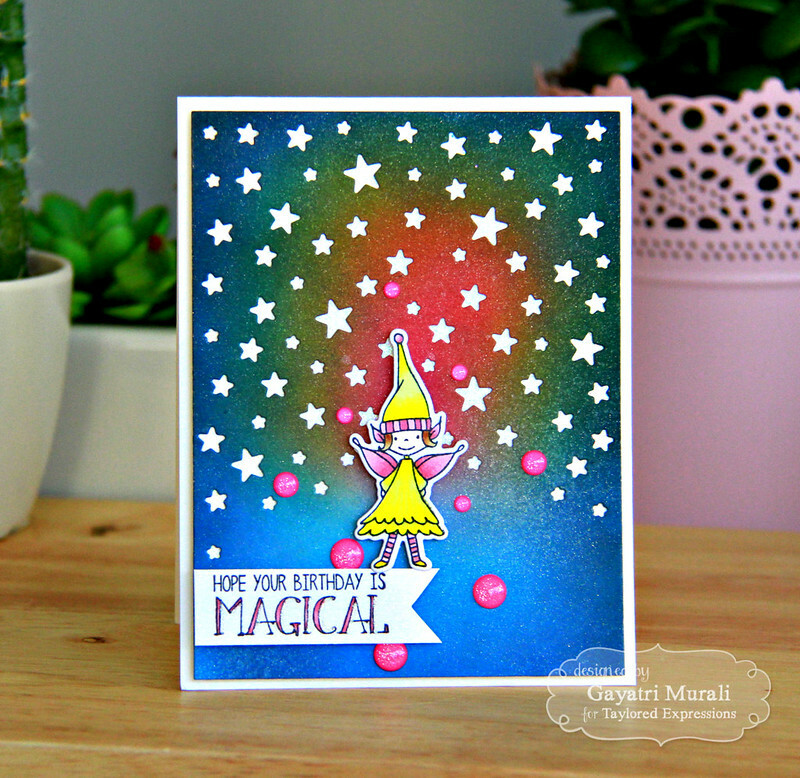 Anyway, today I am sharing with you more Taylored Expressions projects using the May new release products. These products are now available to purchase from Taylored Expressions Store. Without any further delay, here are my cards. This card uses images from Under the Toadstool stamp set and coordinating die along with scallop frame from Frame to Frame die. I sponged the background with distress inks Tumbled Glass, Salty Ocean, Crushed Olive and Mowed Lawn. 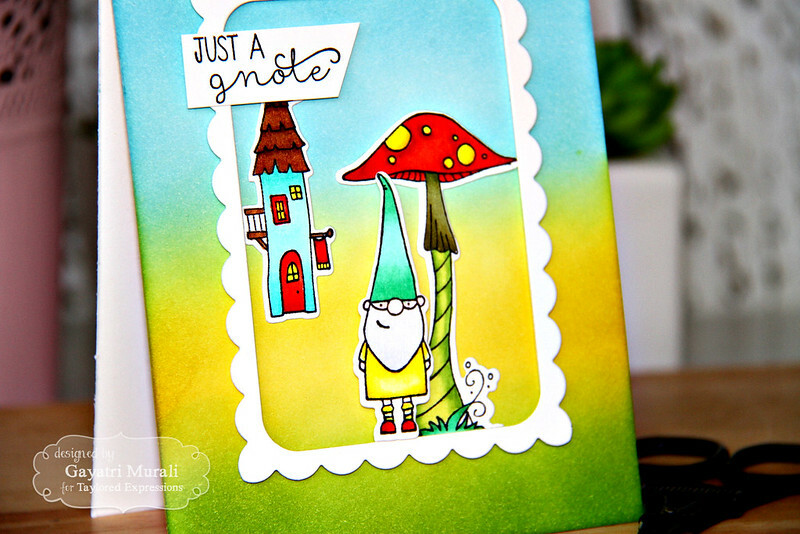 The stamped, copic coloured the images from Under the Toadstool stamp set and die cut them using their coordinating die. I then added a white scallop frame from Frame to Frame die set using foam adhesives to give dimension. Adhered the coloured die cuts images inside the frame. Stamped the sentiment on a strip of white cardstock, trimmed and added to the top left of the frame using foam adhesives. Love the colourful background and the images and frame just pop right out of it. Here is a closeup! 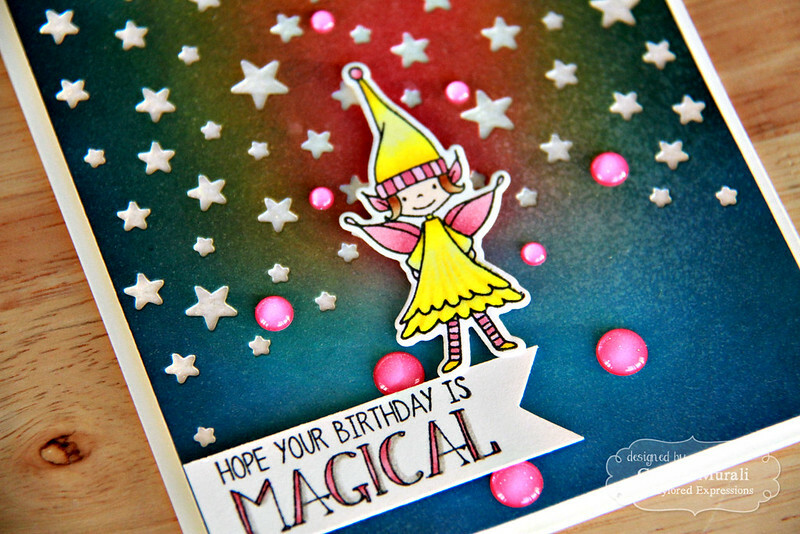 Second card uses Starry Night cutting plate and the fairy form Under the Toadstool stamp set. I sponged Picked Raspberry , Curshed Olive, Mustard Seed, Salty Ocean and Chipped Sapphire distress inks on a white cardstock then die cut the cardstock using Starry Night cutting plate. To make the stars sparkle, I mounted die cut panel on a white glitter paper.Adhered this panel to the card front. The fairy from the Under the Toadstool stamp set is copic coloured and die cut using the coordinating die and adhered on the card front using foam adhesive. The sentiment is also from the same stamp set, stamped and coloured. Finally embellished with sparkly pink enamel dots form Doodlebug. 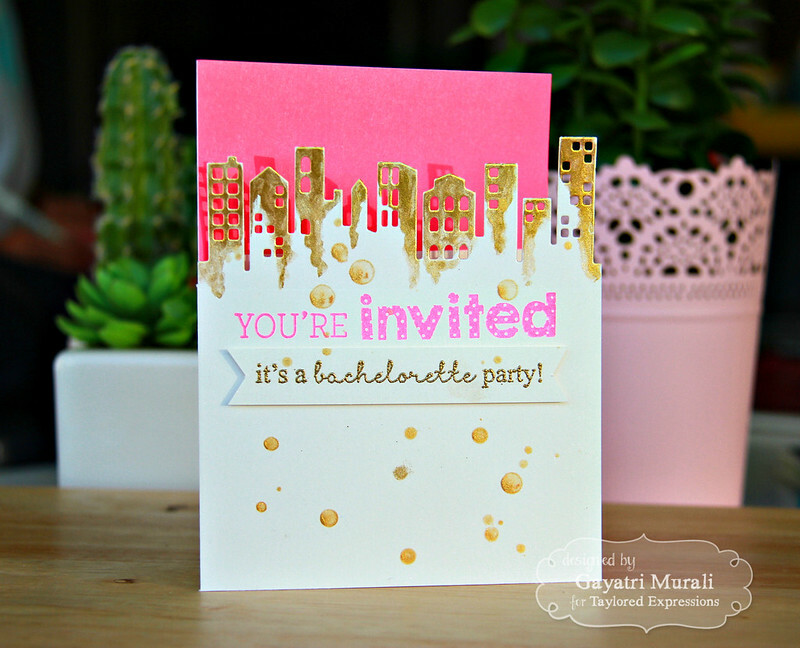 My last card using Downtown border die with Eventful and RSVP stamp sets. 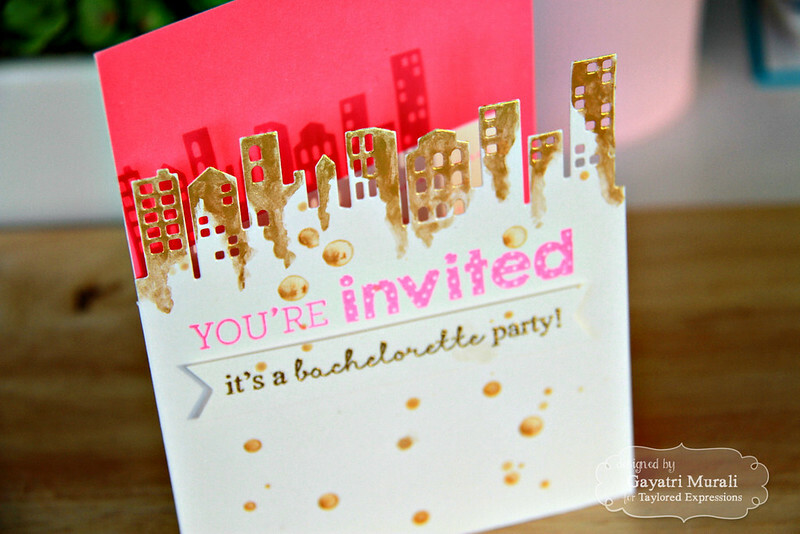 This is an invitation card for a Bachelorette party This die is awesome in the sense that it does not die cut at the bottom of the die. So when I ran through the top of the card, I only had to trim the scored fold edges. I love the partial die cut the card front. I added some gold mica watercolour on the top of the buildings of the die cut. Then did some gold spatter as well. 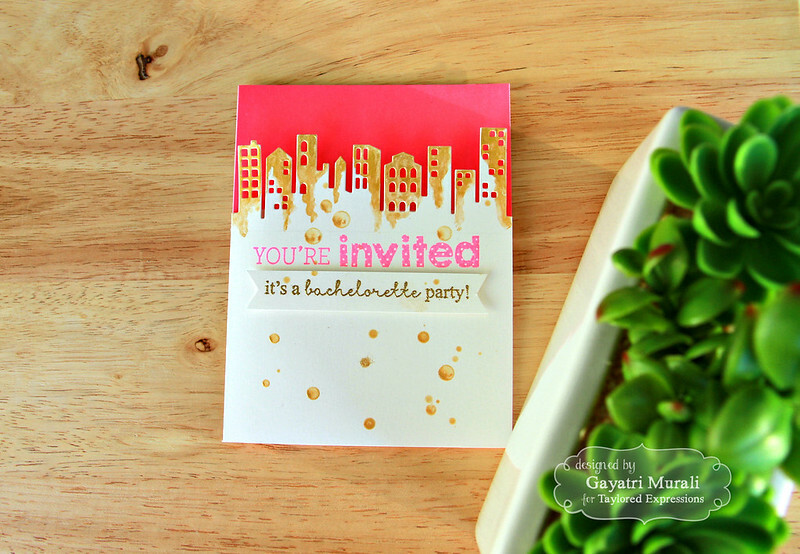 The sentiment “you’re Invited” is stamped using neon pink ink and the smaller sentiment also from Evenful stamp set is stamped in Delicata gold pigment ink and gold heat embossed on a strip fo white cardstock. I then cut out fishtails on the sides and adhered on using foam. 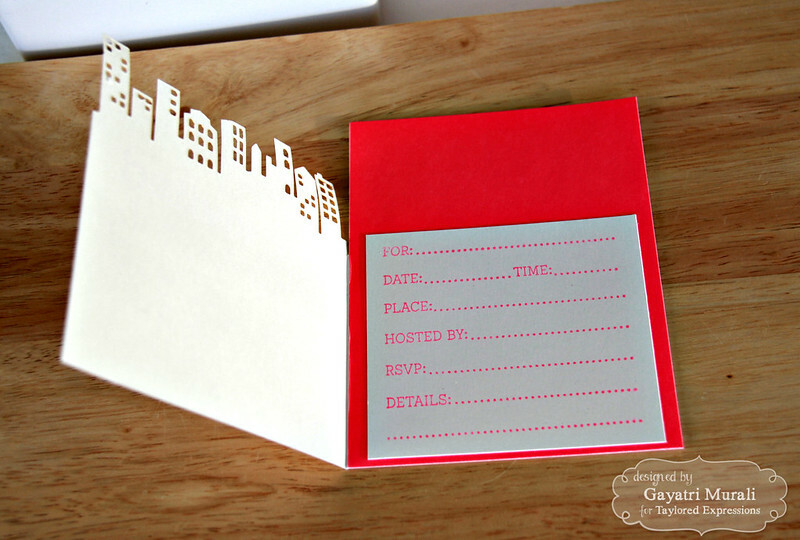 On the inside, I adhered a pink neon panel, then stamped the rsvp stamp on white cardstock, trimmed and adhered inside. Absolutely LOVE LOVE neon pink, gold and white combination. Just so pretty and trendy. For more inspirations using Taylored Expressions new release products, check out TE Gallery. Oh my goodness…where do I start? 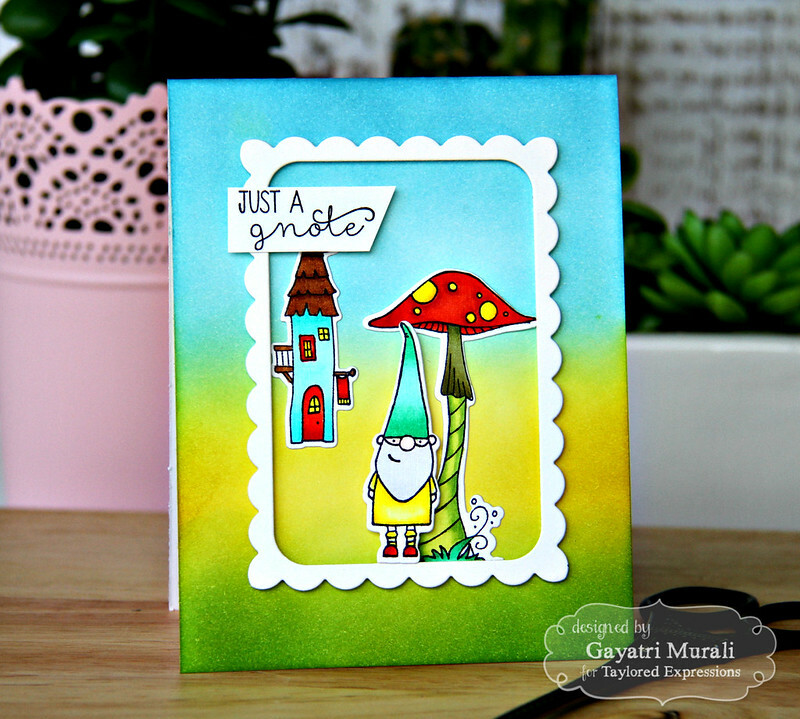 From the cute gnome sentiment, to the beautiful coloring, to the awesome city scene….These are amazing!! !